But we have weird train tracks which don’t look weird to us due to the fact that we are so used to them. South Africa is home to something called Cape Gauge. Named after a town in Switzerland (just not really), Cape Gauge was a calculated choice made by the powers that be during the Molteno Government as the gauge of choice for South Africa. Molteno had an epic beard so he definitely was correct in his decision. Nobody can argue. The Cape Gauge is a narrow 1067mm in width which allows for rather tight turning. South Africa is not mountainous but there are a lot of hills and getting around these requires the ability corner at such extremes. If you want to see this in action, take the train to Soccer City and marvel at the right hander just before you get to the stadium. However, what you gain in turning, you lose with speed. The top speed of a metrorail train is theoretically 130kph. These trains rarely make 60kph which has really crippled the universal adoption of commuter trains. Once someone can afford a car, they will almost always make the jump. The speed difference is just way, way too big. Standard Gauge can accommodate speeds of over 300kph. South Africa adopted this gauge in 1873. Alas, 60% of the world has adopted Standard Gauge and this does pose some problems for rail expansion in the country as any coaches imported from Europe, America or Asia needs to be customised for Cape Gauge use. Oddly enough, coal trains in America run on Cape Gauge. I have a feeling that’s because South Africa uses Cape Gauge. Anyway, the most important difference between the two gauges is the look. Cape Gauge looks gorgeous whereas Standard Gauge looks ugly. Quite simple. Don’t believe me? 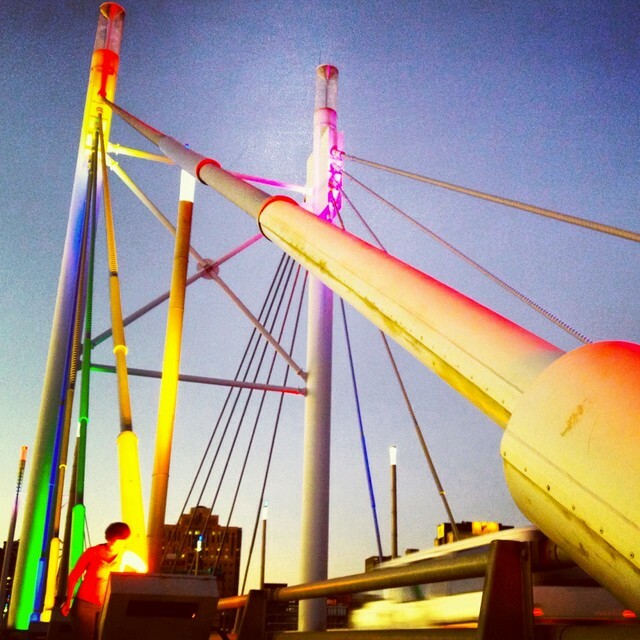 Check out the pictures from the Worldwide Instawalk that was held in Braamfontein last weekend. This picture is one of my favourite pictures. Yes most of it is heavily edited, but the beautiful sunlight caused this striking shine on the tracks that, it just, wow. It just made me feel. Standard Gauge is just wide and I dunno, I don’t think you can take a picture this appealing on an overpass above the tracks in England. The train yards just outside Park Station are truly breathtaking. This is where you see the true veins of the city as they branch out and reach the furthest corners of the city. Once they reach these end points, they bring in millions and millions of people who skilfully contribute to the running of this great metropolis. 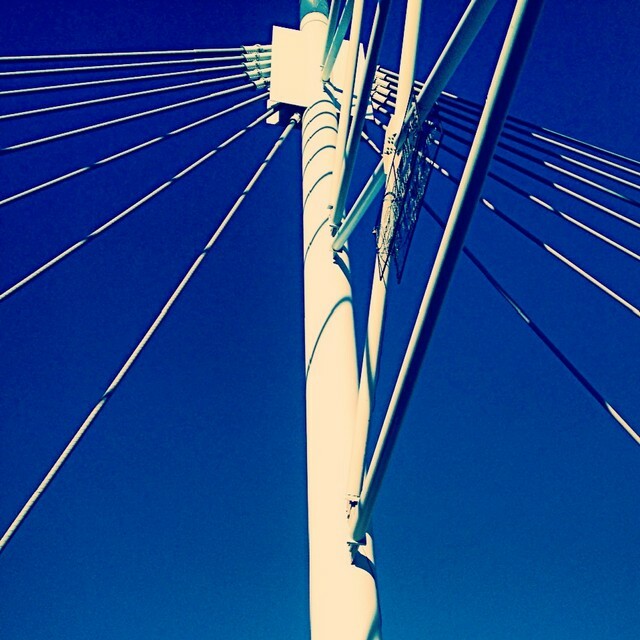 One of the literal bridges that helped celebrate more of the city’s life is the Nelson Mandela Bridge. It’s just stunning to look at from afar, driving across and walking across. It’s one of the South African projects that were delivered on time. You would know this if you’ve done any project management course in the last five years. I think you need to walk this bridge at sunset. It will have a profound effect on you as a person as it digs deep and exposes your soul. In a good way. There are quite a few more pictures that I took on the walk. Look out for the tag #ig_braamies and #findingjozi on Instagram. The latter is also fed onto the Finding Jozi Facebook page. Also, there’s a video!